The only film ever to star Doris with Frank Sinatra. At the time, they were the world’s most popular singers, and they didn’t even sing any complete songs together! The soundtrack album only reached #15 because Sinatra had his own version (on a different label). When song-writer Alex Burke (Gig Young) enters the lives of the musical Tuttle family, each of the three daughters falls for him. The family lives in the fictional town of Strafford, Connecticut. Alex's personality is a match for Laurie Tuttle (Doris Day), as both she and Alex are seemingly made for each other. Her two sisters, although seeing other men, are infatuated with him as well. Soon Laurie and Alex are engaged, but when a friend of Alex's, Barney Sloan (Frank Sinatra), comes to the Tuttle home to help with some musical arrangements, complications arise. His bleak outlook on life couldn't be any more contradictory to that of Alex's, but Laurie is infatuated with him. That infatuation leads her to run off with Barney on what was supposed to be her wedding day to Alex. Meanwhile, Laurie's two other sisters, Fran (Dorothy Malone), and Amy (Elizabeth Fraser) each marry, despite still having feelings for Alex. Barney, with a black cloud perpetually hanging over his head, decides one evening to kill himself, feeling Laurie would be better off with Alex, as he would be a better provider. Barney drives into oncoming traffic during a snowstorm with his windshield wipers off. But he lives, and with a new found affirmation of life, and he finally writes the song he had been working on, finding his self-esteem in the arms of Laurie. The character of the self-destructive Barney Sloan was originally written to die at the end of the film when Sloan drives into on-coming traffic during a snow-storm. Sinatra, whose characters in his two previous films From Here to Eternity (1953) and Suddenly (1954), filmed before but released after Young at Heart perished at the end, thought Sloan should live and find happiness. 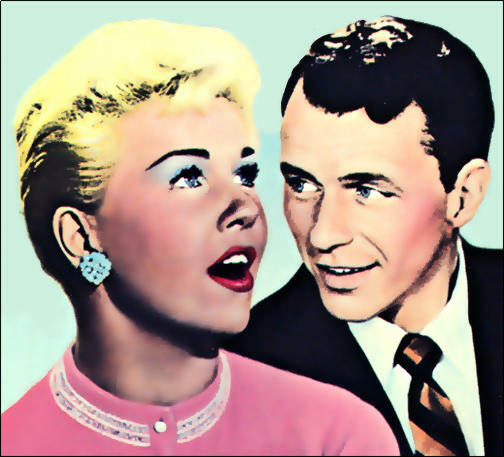 Sinatra's growing influence in Hollywood was enough to have the ending re-written to accommodate his wishes thus creating a corny instead of a believable ending. Happy endings triumph once again. Laurie Tuttle: All I know is there's a straight jacket waiting on you with your number. Barney Sloan: Sometimes when you're on the outside looking in you see some things other people can't. Laurie Tuttle: When you consider that you get older every single day when you wake up, it can tempt one to rush into decisions a little! Laurie Tuttle: You know what's the matter with a lot of marriages I've seen, no laughs. Laurie Tuttle: I do my shoplifting at the finest stores. Barney Sloan: Why did you have to look so beautiful! "This may be the only Hollywood musical that bears no music credits. Musical director Ray Heindorf had his name removed because of a new ruling that the term 'musical director' was to be replaced with the credit 'Music supervised and conducted by...' "
"Feature film debut of Lonny Chapman. " "Ethel Barrymore was very old and feeble during the filming and spent most of her time between takes in a wheelchair. She was not crippled but was getting frail and had to conserve her energy for her onscreen performance. Frank Sinatra threw a surprise birthday party for her on the set, a gesture that clearly moved and touched her. " 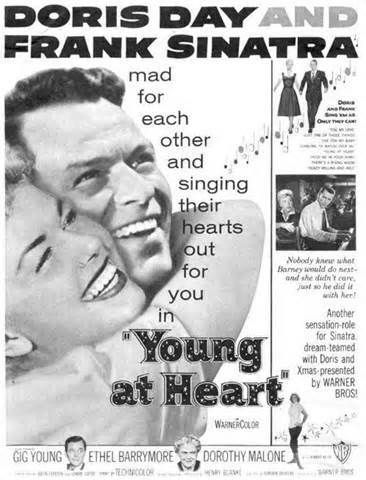 Listen in on a recording session when Doris first recorded "READY, WILLING AND ABLE" from the movie, "YOUNG AT HEART". We are in the studio with her. How often does that happen?